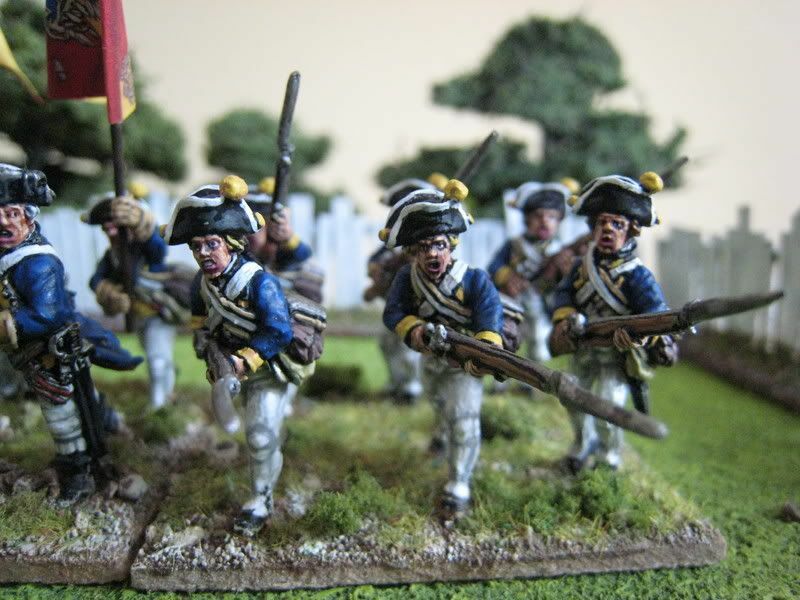 The Leib Regiment (sometimes called du Corps) was one of the first Hessian battalions to arrive in America. The Landgraf himself was the regiment's chief until March 1783, when command passed to the Landgraf's son, Erbprinz Wilhelm. Colonel Friedrich von Wurmb was the regiment's commanding officer, by all acocunts one of the army's better officers. Major Mackenzie of the Royal Welsh Fusiliers wrote that Wurmb was "clear headed and cool" and that his regiment was "the best discipled in the Hessian Corps." With the ruler of Hesse-Kassel as it's head, the regiment was a favoured unit in the Hessian army. Apparently it consisted of taller and fitter men than the other line regiments. It certainly seems to have performed more than adequately in the AWI. The regiment fought at White Plains, Brandywine, Germantown and Monmouth. From 1778 to 1783 is was on garrison duty in New York. The "British Grenadier!" scenarios require this unit to have 18 figures for White Plains and 24 figures for Brandywine. I painted the first 18 back in 2005 and finally finished the remaining 6 figures last week. I found these charging Perry figures quite tricky to paint. The poses mean that there is a large amount of "filing" and the position of the muskets carried by the figures in the second row means that the figures' faces are difficult to reach. So not one of my tidier units, to be honest. Later in the week will be some Conquest Miniatures settlers and after that Lord Dunmore's Ethiopians! 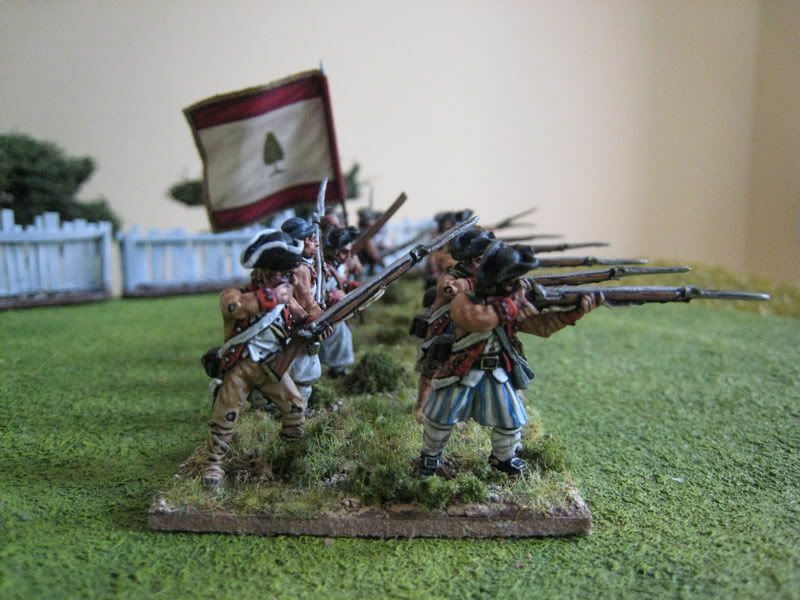 My next Hessian regiment, to be painted at Christmas, will be the von Bose Musketeers for Guilford Courthouse. 24 figures. Painted 2005 and October 2007. Flags by GMB. 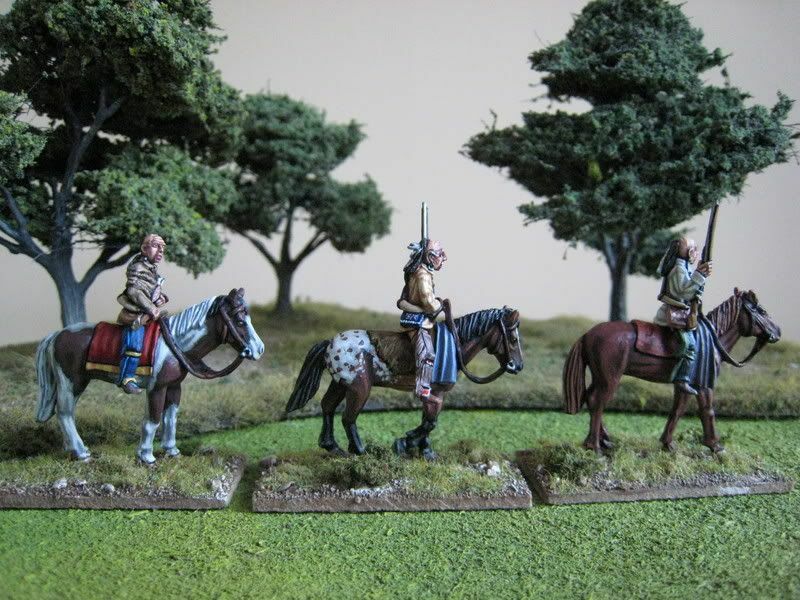 This is the "mounted Indians" pack from Conquest Minatures' "500 Nations" range; three generic natives who will pass for most Eastern tribes in the second half of the 18th century. Beautiful sculpts, but how will I use these figures? 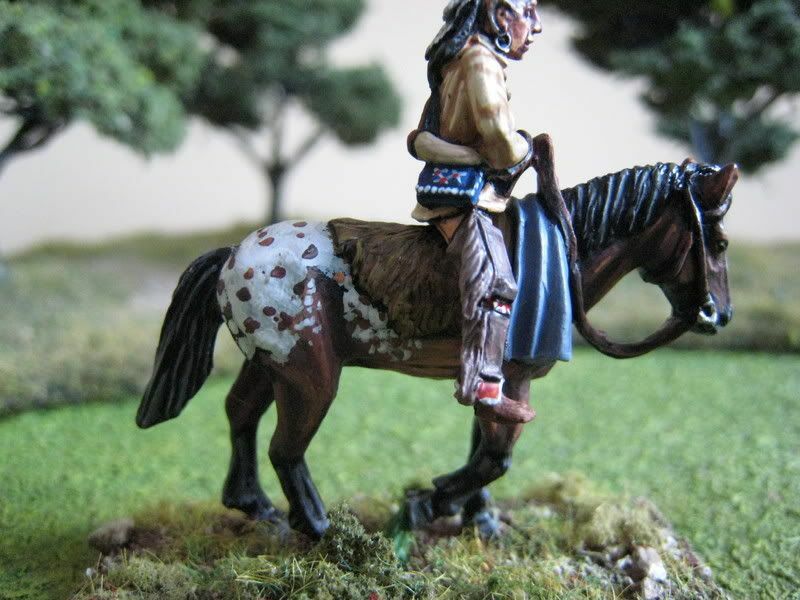 They will not see combat as such, but I envisage using them either as scouts for Burgoyne (hence the "Saratoga" label) or as general "scenic" Iroquois for something like Oriskany or the F&IW. As readers know, I'm very keen on putting "extras" on the table to add some colour, and these chaps certainly provide that. I set out to paint the horses in colours that were not matched by "Western" cavalry, and each colour scheme is a new addition to the colours I use on horses. To be honest, I'm not entirely sure what the official names of the horse colours are, or even whether they are appropriate for the mid 1770s. But I think they look suitably "native" and they took a while to do. As a rough estimate, each horse took just over an hour to complete (but then I am a slow painter when it comes to horses...). I decided not to give the Indians themselves any war paint, as they are not really on their way to confront settlers; these chaps are on patrol, not looking for scalps. 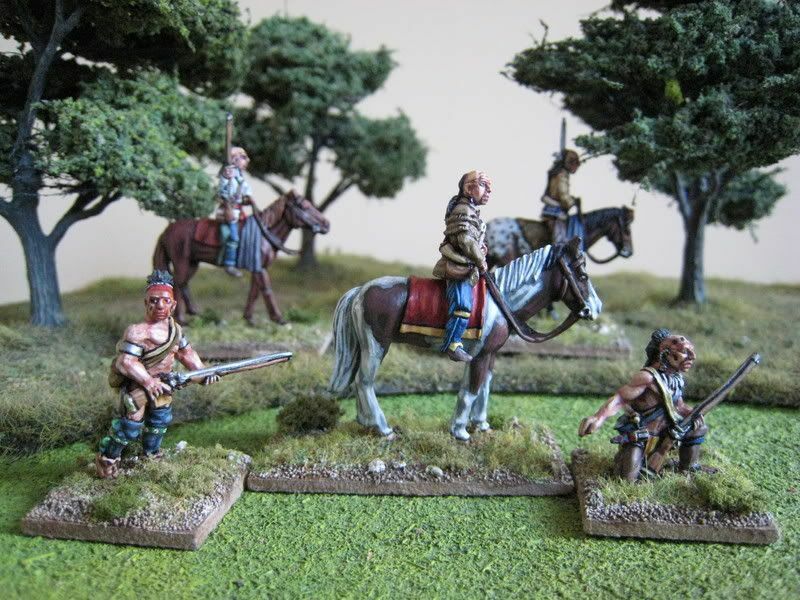 In the second photo below, you can see how the mounted figures stack up against Perry and Conquest "foot" Indians. I have to admit, these figures have leapt up to the top end of my favourite sculpts. Sometimes one's painting just "works" and sometimes it doesn't, for reasons that you can't quite understand. I'm sure readers know what I mean. When I post pics of the Hessian du Corps Regiment early next week, you can see figures that don't really work - I have no idea why, but they just look, well, messy. These, on the other hand, seem to have come out fairly well I think. The quality of the sculpts is certainly a factor - these are outstanding and very characterful figures, which look like something out of a Robert Griffing painting. 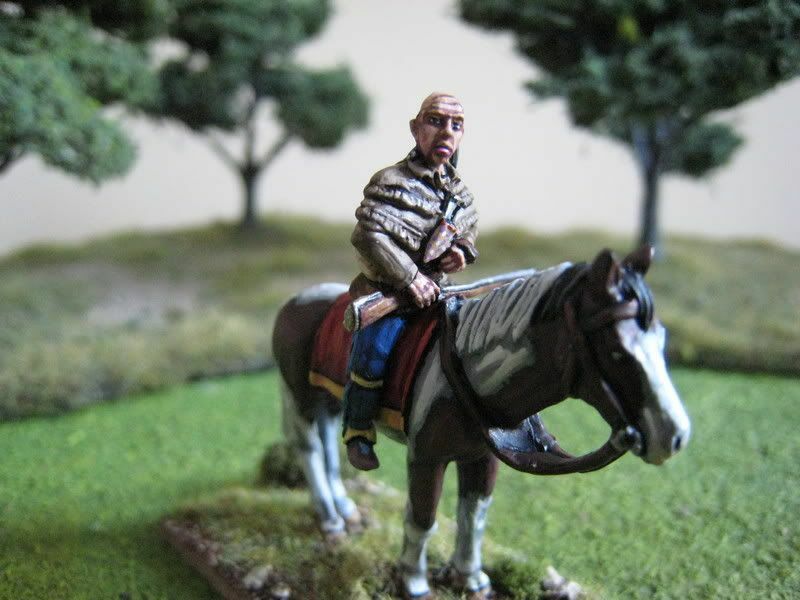 It's odd the way that units which appear on the table the most often are usually "ok", whilst those that have very little wargaming purpose, but are a bit different, are often painted with more effort. Anyway, I'm rather proud of these fellows, which explains the excessive number of photos! 3 figures. Painted October 2007. 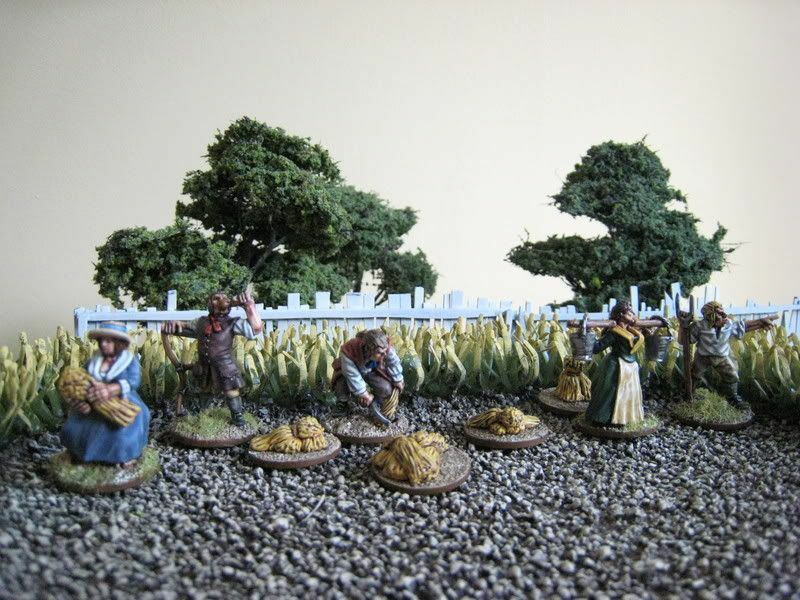 This is another pack of Foundry's 18th century civilians, namely farmers and country folk. 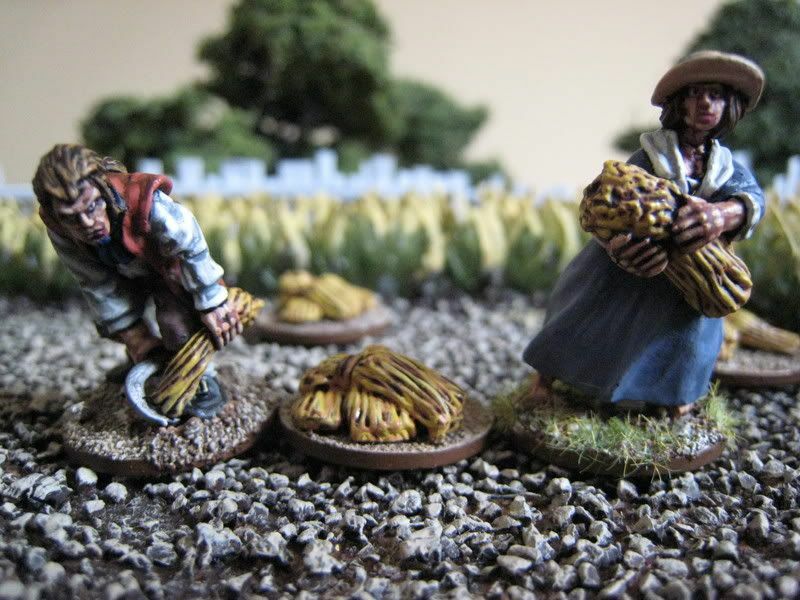 For £10 you get five figures and four bushels of wheat, which may or may not be good value. I actually quite like these figures as they will probably be more useful than the urban gentry types I painted earlier. 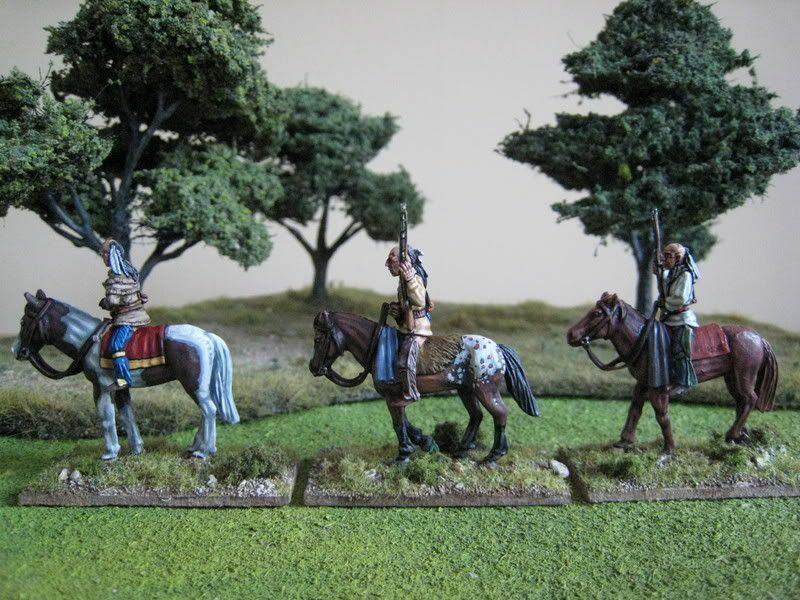 Most AWI battles involve a farm or two and I expect these figures will often be floating around the edges of the table. The wheat blobs are also quite handy for my Touching History wheat/corn fields, one of which the figures are standing in. The figures themselves possess the usual characteristics of this range - huge, oversized hands (look at the hands of the woman carrying the wheat - the right hand is actually bigger than her entire head) and large calves and bottoms. Another particular problem with this range, which I remarked on earlier, is that the metal is extremely strong and quite un-bendable. So when you have a figure like the woman in blue who is leaning forwards, it is impossible to bend the figure back upright. Maybe she's supposed to be a hunchback, but I'd rather she wasn't and it's annoying. I haven't yet acquired the Perry pack of civilians, so I don't know how all these Foundry figures compare specifically to them, but they are a fair bit larger than Perry figures generally. Incidentally, Foundry are now offering 20% off everything on their website until 5 November, so you can buy this pack for £8; i.e. 50p cheaper than it was before the last round of price-hikes. That clearly makes it better value, although you'll need to buy lots of other stuff to escape being clobbered on postage! 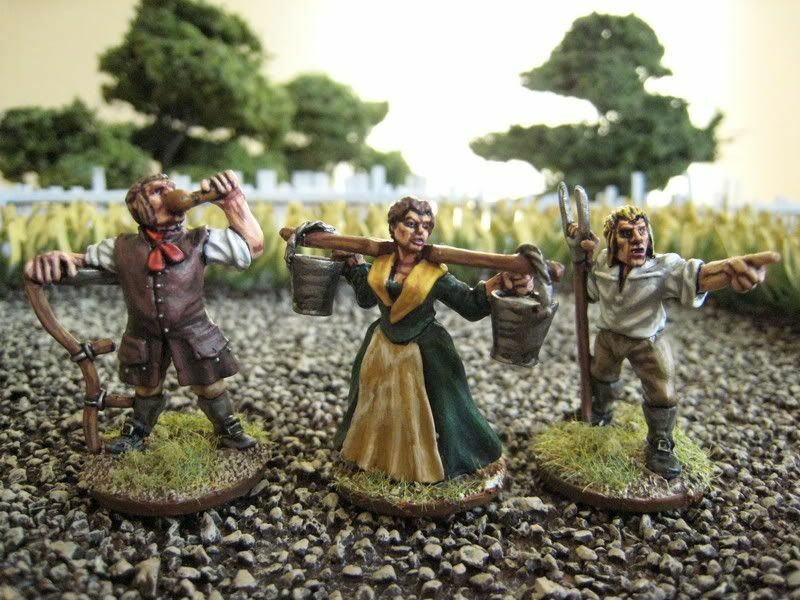 Having had a quick perusal of the 18th Century Civilians range, I quite like the look of the smugglers pack - three of the figures will do nicely for militia, whilst I can envisage the chap waving the lantern as someone peering through the mist at Germantown wondering what on earth all that noise is. I might have to buy that pack, if I can find another 9 packs that I want! 5 figures and several bushels of wheat. Painted October 2007. "I'm going to take a short break from the AWI" - who was I kidding? As Michael Corleone would have put it (had he been a wargamer), every time I think I've got out, the period pulls me back in. I've realised that the problem is that I regard anything that is not AWI-related as a waste of time. 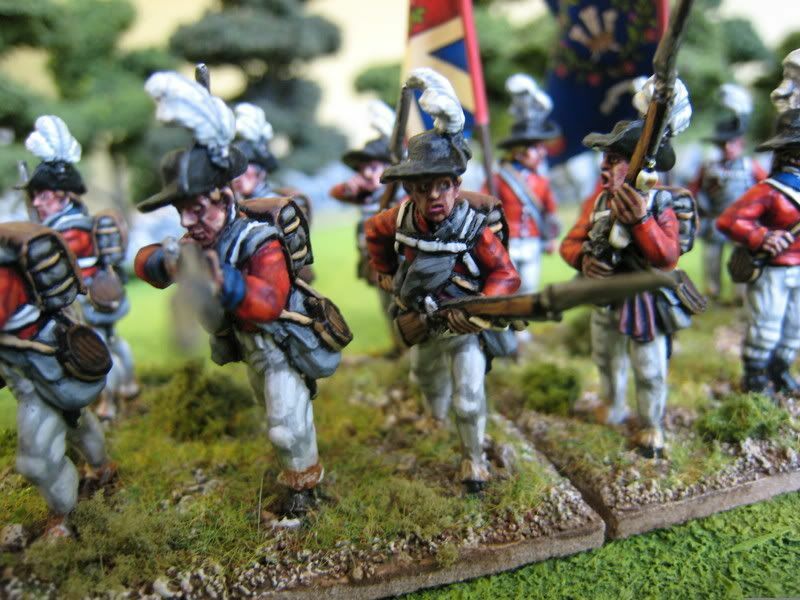 Yes, I could finish off Newcastle's Whitecoats, but in the time it would take to do that I could paint another British Saratoga regiment. In any event, the cancellation of SELWG and the ongoing nightmare that is the British postal services means that I am not able to acquire the other few packs of figures that I need to complete the regiment. So the Whitecoats are being bumped off until later in the year and I've spent the past couple of weeks feverishly painting more AWI stuff. This happily means that there are lots of pics to come over the next few days. It's also made me wonder whether I could paint all the lead I've bought this year before the end of December - that really would be a first. 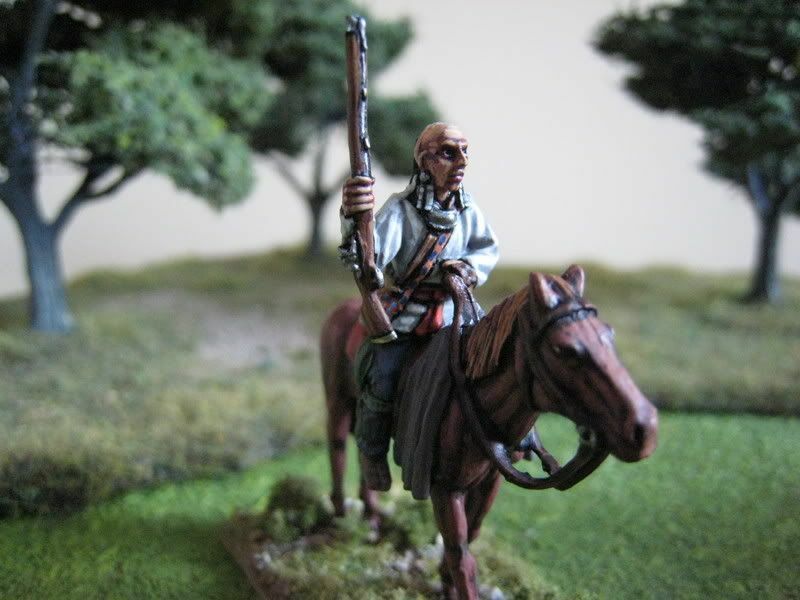 On Monday or Tuesday there will be photos of more Foundry civilians, followed by Conquest Miniatures' mounted Iroquois (see the pic above) and some rather angry frontiersmen and settlers. After those, hopefully early next week some time, will be the two Hessian regiments that I wanted to finish off. I think I'll then crack on with the 62nd Foot and another, as yet unidentified, American regiment. 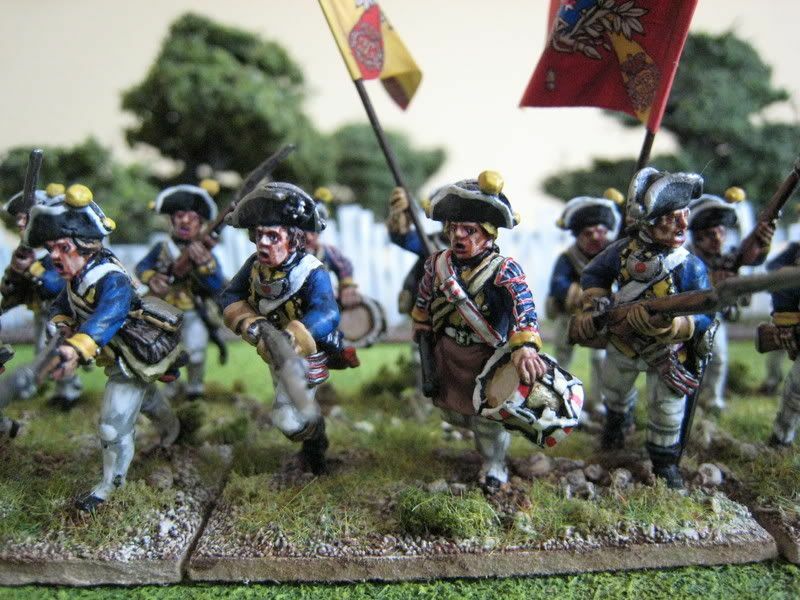 I bought the figures for the Hessian von Bose regiment at Colours, so want to paint that unit by the end of the year. Incidentally, I am half way through Mark Urban's "Fusiliers" and it is outstanding, so go out and buy it! This regiment was raised by John Glover in Marblehead, Massachusetts, in May 1775. The following year it was taken onto the Continental Army's establishment as the 14th Regiment, but became known as "Glover's Marbleheaders". Many of the recruits were seamen and fishermen, and the regiment won fame by supplying the oarsmen who ferried Washington's army across the Delaware to attack Trenton. It is recorded that some African Americans served in this regiment. 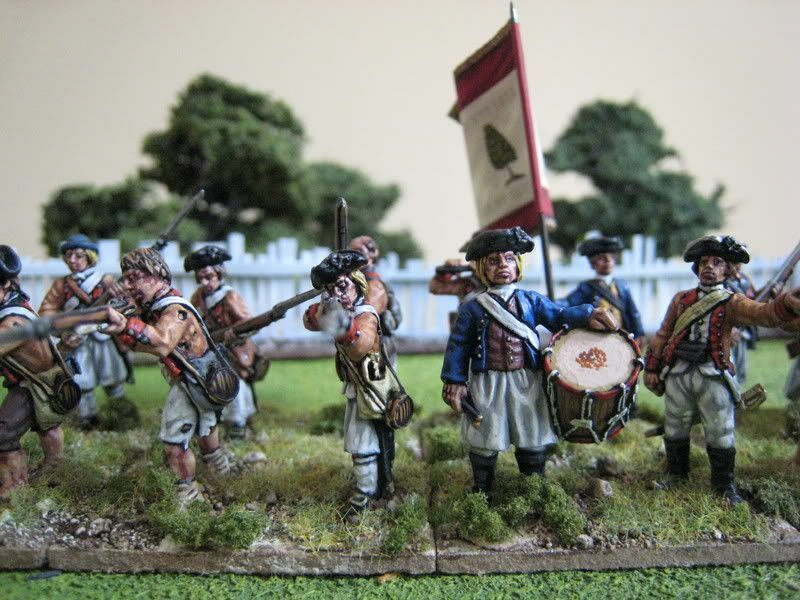 Eureka Miniatures make specific "Marbleheader" figures, representing soldiers in various seaman's clothes. The range includes an officer, drummer and standard-bearer, together with 4 rank-and-file figures: loading, firing, advancing and charging. I spent a while musing over how I wanted to use these figures and model the regiment. I am not a fan of units that are in multiple poses - my battalions are either loading/firing, advancing or charging, but never all 3 at once; I just think that looks very odd. 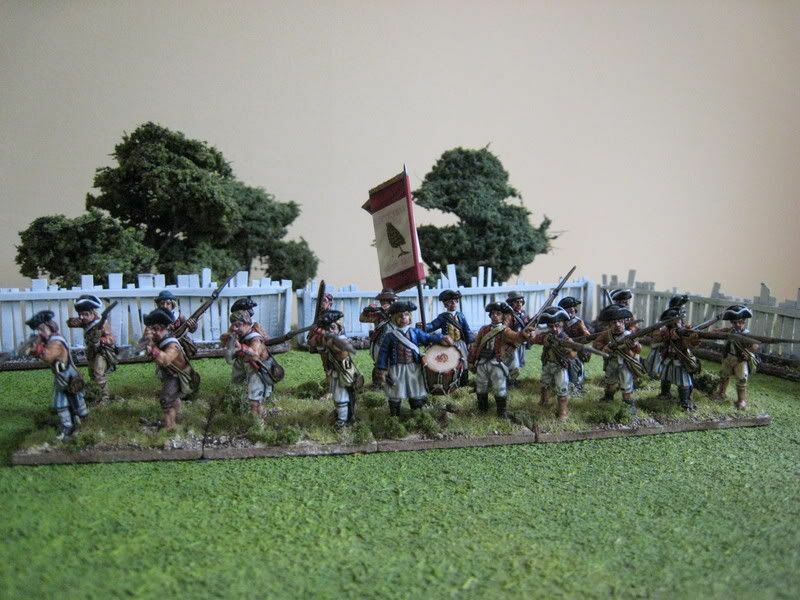 I thought about using the figures as skirmishers, but the Marbleheaders fought in the line as well as ferrying Washington about. I found out that other regiments that recruited from seaside areas often included soldiers who wore sailors' attire, so I decided to form a full strength firing-line unit that could be used for any Massachusetts or New York regiment. Having decided on that, it seemed only fair to stick to Eureka figures to bulk out the ranks; so I added some more "ragged Continental" figures to add variety and emphasise the "ad hoc" appearance. I have some advancing and charging posed figures left over - I will either add these to another "charging" regiment or use them as skirmishers. Mollo refers to the regiment wearing "light coloured coats, drab or brown, with red facings". Therefore, I went for a lighter colour than the dark brown that is often used for this unit (I used the Foundry "Chestnut" palette with a couple of self-mixed intermediate shades). Examining the figures, it became clear that the standard bearer and drummer figures were wearing sailors' tunics and not uniform coats like everyone else. I thought of painting those the same light brown as the other figures, but decided that if they were sailors they should really have navy coloured coats, so that's what they have. I gave some of the specific Marblehead chaps blue stripes of various hues on their pantaloons to add to the nautical appearance. I looked at what GMB flags I had to hand and selected a "liberty tree" flag on the basis that this kind of motif was common in Massachusetts regiments. 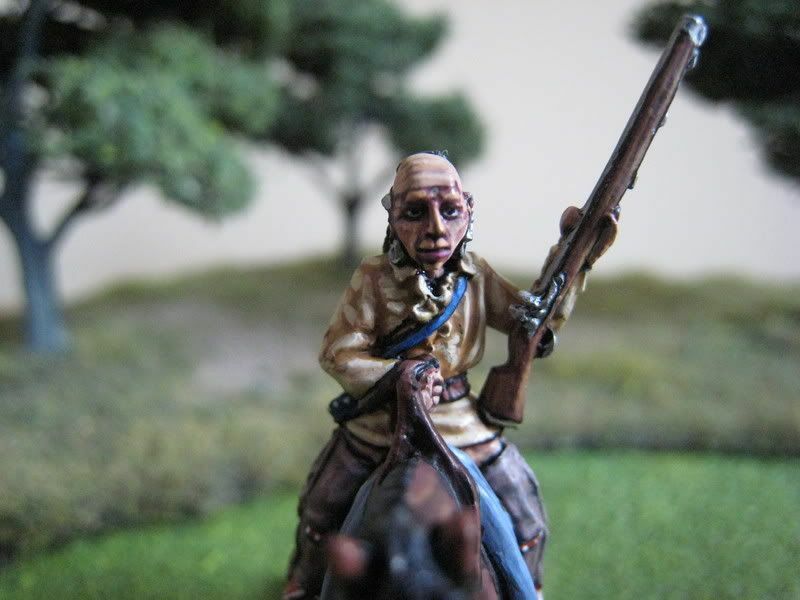 I always paint the faces of firing figures with the right eye open and the left eye closed. I am left-handed, and the last time I went "shooting" (on a stag in Brighton) I freaked out the instructors by closing my right eye and squinting out of my left - the instructors found that so odd that I wasn't allowed to continue! I remembered that story whilst painting the last firing pose figure, and so I reversed his eyes just for a laugh. In the photo on the left below you can see him, second from the right - the only left-handed man in the battalion! 20 figures. Painted September 2007. Flag from GMB. Mark Spackman was visiting from Australia and that gave me an excuse to actually put on a game (a rare event these days). Mark is part of the Melbourne wargaming community and helps out at Eureka Miniatures; as the Eureka site shows, Mark is also a pretty mean painter. The choice was Bunker Hill or White Plains, and I chose the former simply because it was a less complex game and lended itself more readily to a relaxed (and rather boozy) Sunday afternoon. 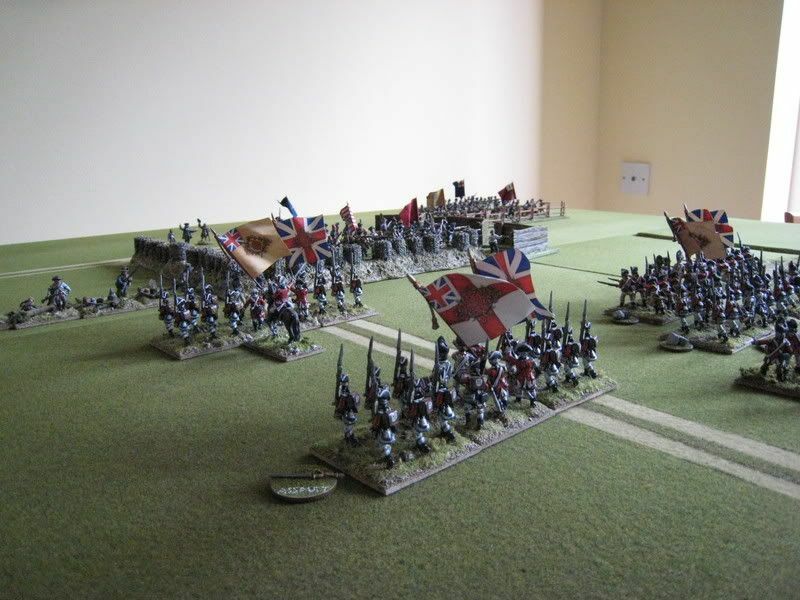 It was Mark's first game of "British Grenadier" so he took the British side. Bunker Hill is an excellent game for learning the rules - it shows how well the movement and command systems work. I like playing the Americans in this battle because the tactical decision-making, which I'm never any good at, is minimal. The only terrain I have consists of TSS tiles which I specifically bought to make up the Freeman's Farm battlefield, so here they are completely functional and you have to forget about the stream on the right hand side. The marsh is from Realistic Modelling, fortifications from Snapdragon Studios and Hovels. The fencing is by Last Valley. 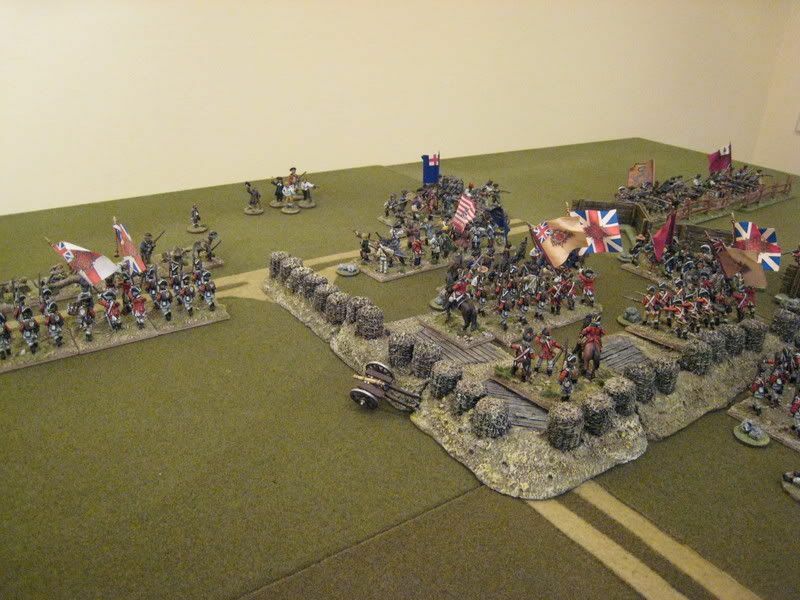 The scenario is contained in the "British Grenadier" rulebook itself, rather than the first scenario book. All the American forces begin on the table, whilst the British acquire a couple of 6-pounders in the 8th turn and Clinton's brigade (comprising the 63rd Foot and 1st Marines) shortly thereafter. Mark put his two brigades on "assault" orders and just went for it. The British battalions quickly accrued disruption points ("DPs") by passing through the marsh and rolling some "ones" on the movement dice (I mark DPs through the use of stone cairns - bits of bark painted grey and mounted on pennies). As soon as the Brits came in range the American fire took its toll. 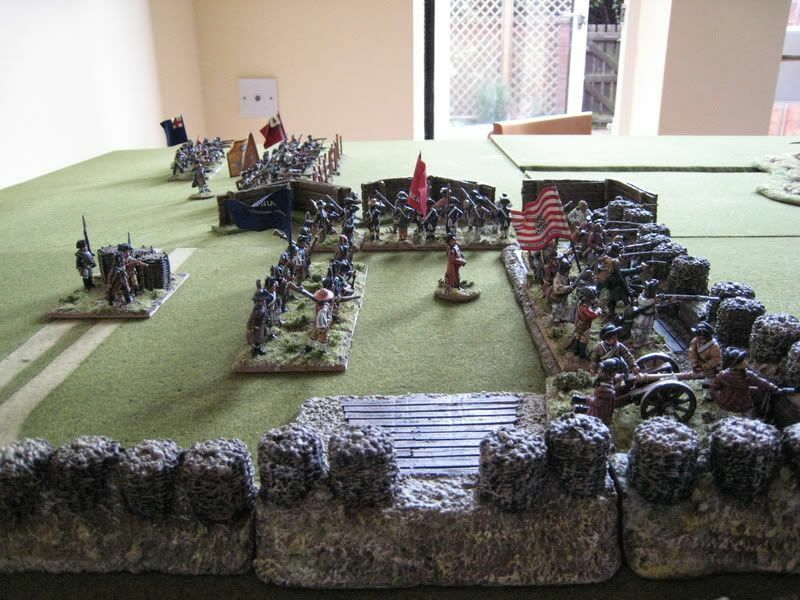 By the time the lead units reached the redoubt they were all on 3 DPs and so had to stop and redress the ranks before attempting any charges. 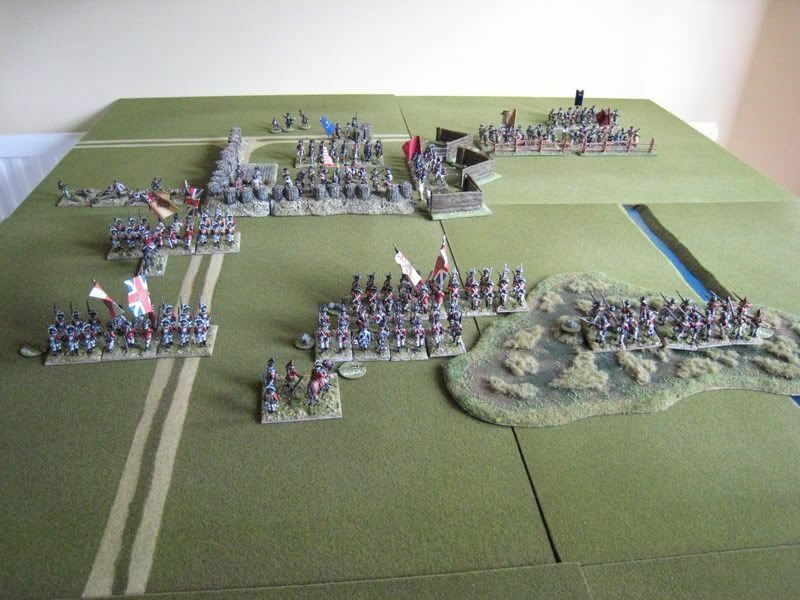 In the photos above you see the British first wave advancing, with Pigot's brigade of the 38thFoot and 43rd Foot on the left and Howe's brigade of the 52nd Foot, Grenadiers and light infantry on the right, and the Rebels awaiting their fate. The light infantry found themselves exposed at the fleches to the east of the main redoubt. Taking fire from three American units, both to the front and in enfilade, they took severe casualties, failed the subsequent morale test and also retreated (exactly what happened to them in "real life"). 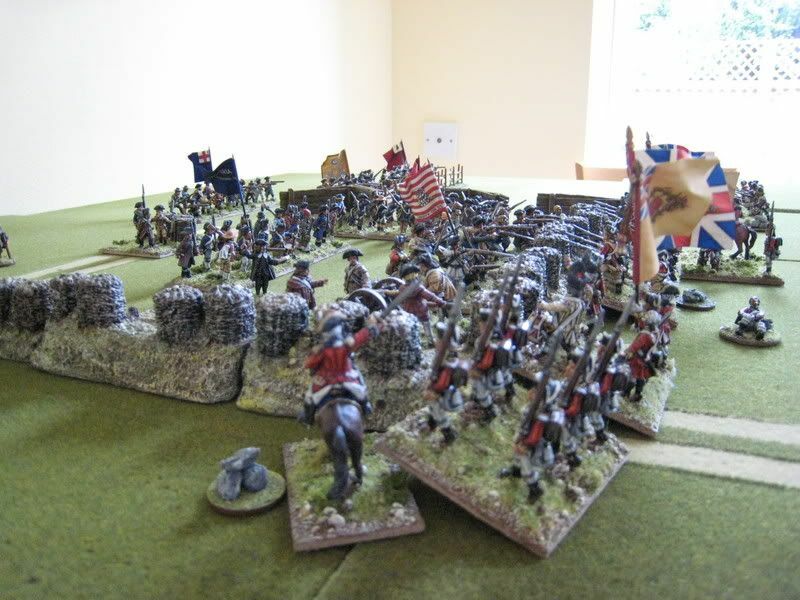 The Brits were having the worst of it, but at that point Mark rolled a double six for the 12-pounders on Moulton's Hill and I threw a very bad "risk to general" throw, which resulted in Colonel Prescott being carried from the field mortally wounded. The tide then turned. Continued well-aimed fire from the 12-pounder battery quickly had the American regiments in the redoubt taking casualties and some high rolling from Mark enabled the 52nd Foot to break into the redoubt, quickly followed by the 38th (in the interests of keeping the game moving, retreating units were allowed to recover quickly). 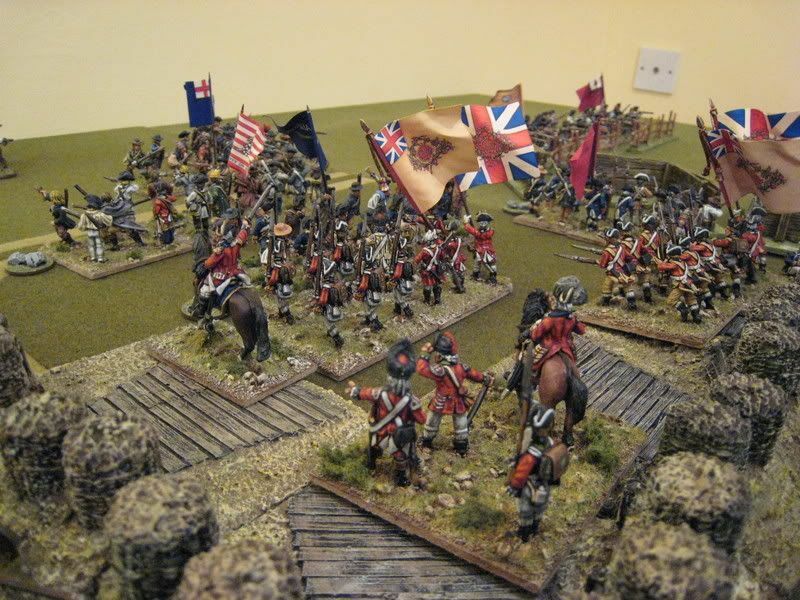 With the Grenadiers moving up in support it became clear that the British were going to carry the day without even needing Clinton's brigade, now landed on the beach and moving up to the battle. The 43rd were moving round the flank of the redoubt and would eventually have cut off the American retreat. 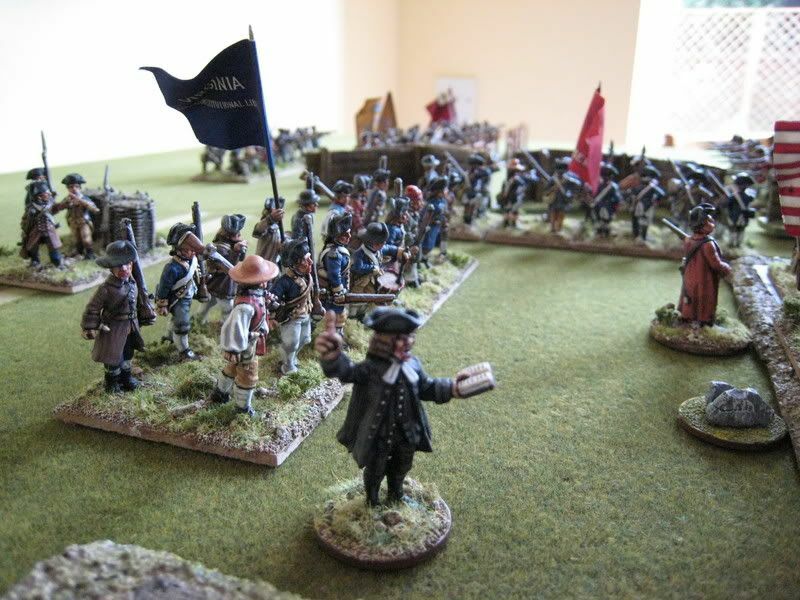 Mark had two regiments in the redoubt but having suffered almost 50% casualties they were in no position to do anything other than trade volleys with the American units I had kept in reserve and which now replaced the men who had run from the British assault. Given the low strength of the Brits, causing casualties even against militia was difficult. The 38th managed another lucky charge, but the melee was unresolved - even in the jaws of defeat the Yanks were putting up a splendid fight. The pics below show the final positions, the field bathed in the glow of the setting sun. Mark had achieved a better than historical result for the Brits, but at horrendous cost. The 38th, 52nd and light infantry had lost over half their strength, although the Grenadiers and 43rd were relatively unscathed and Clinton's brigade was not even engaged; so casualties were significantly lower than they were in "real life". The Americans suffered far fewer casualties and were legging it from the field to hide and fight another day. 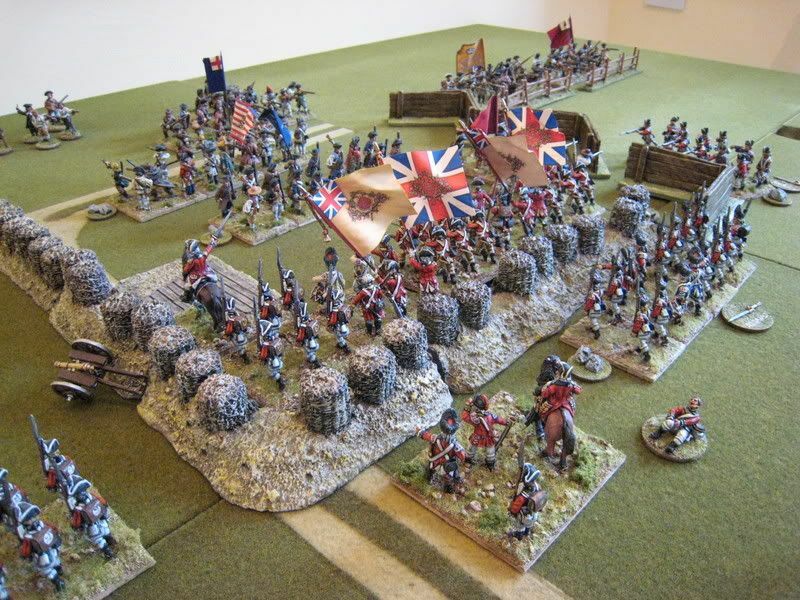 We went easy on regimental and brigade morale throws, which may have had an impact on how the British reacted after the 38th and light infantry had broken. But the way the battle developed was relatively true to life - in "British Grenadier" the British are not invincible, and pushing them on in a disrupted state will lead to serious problems. 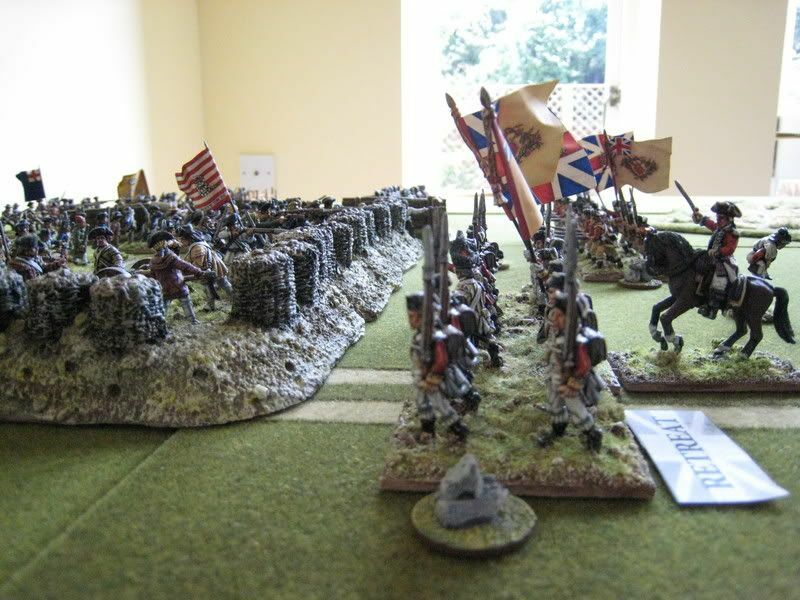 Charging into the redoubt needs a lot of luck and careful coordination. Units can only charge if the brigade commander is in base-to-base contact, which created difficulties for the light infantry as they found themselves unable to charge and simply trading volleys, much to their cost. Many thanks to Mark for such an entertaining day! Just a quick note that the much-awaitied "Fusiliers" by Mark Urban has been published, in the UK at least. Amazon UK are selling it at half price here. My copy hasn't arrived yet, but a quick flick through a copy at Books Etc showed it to be handsomely-produced, well-illustrated and quite meaty. It essentially traces the 23rd Foot (Royal Welsh Fusiliers) from the start of the war in 1775 to Yorktown in 1781. I imagine it will be similar in format to the same author's "Rifles", about the 95th in the Napoleonic Wars. Definitely something to go to the top of the reading pile (which in my case is a very big pile....). The release of this book gives me an excuse to post up a pic of the Perry 23rd, one of my favourite regiments from my collection. 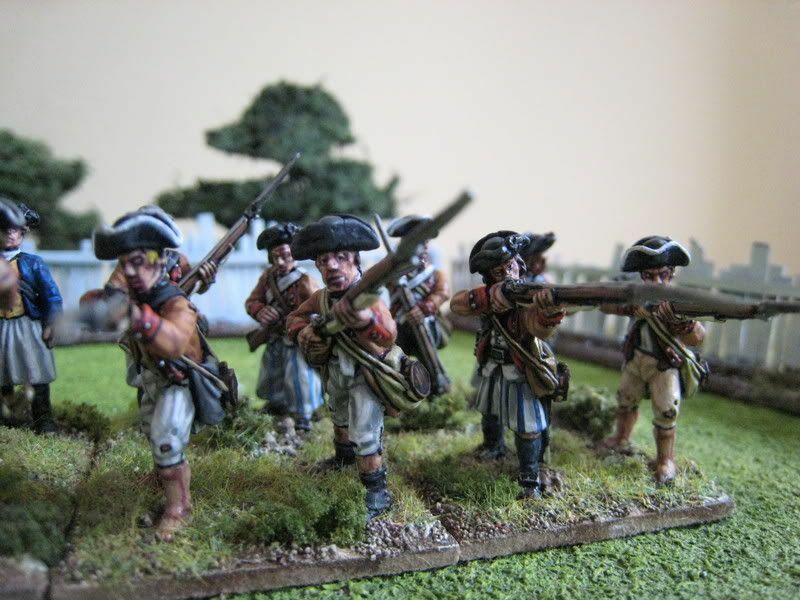 Painting news: Glover's Marbleheaders are finished save for a bit of basing. I'm quite pleased with the way they turned out, although I would have done a couple of things differently now I've seen the entire regiment together. Also finished at the weekend was my first batch of 30 Beja tribesmen for the Sudan; these are grouped together on large bases as opposed to the single figures I painted back in May. Pics as soon as possible. For October I am going to take a short break from the AWI; well, at least from painting large regiments. This is for 2 reasons. First, I want to duck and dive between various odd figures. 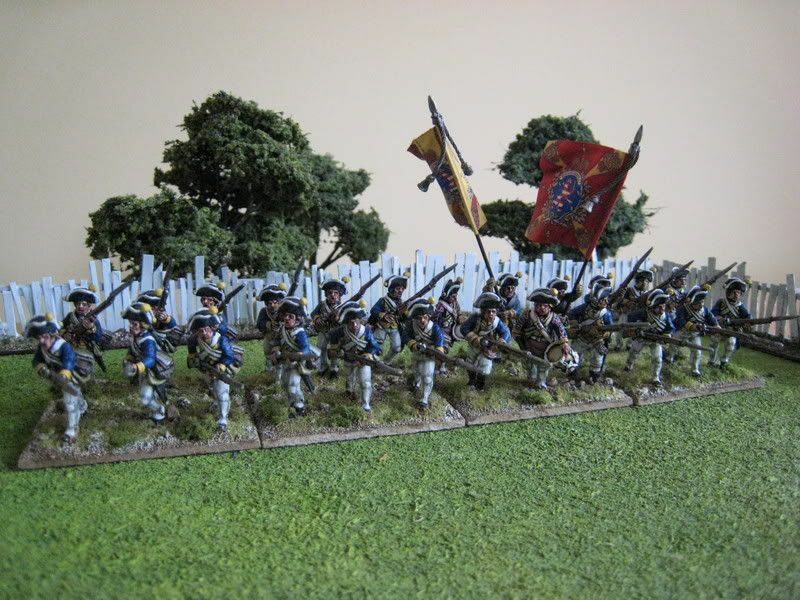 Since the beginning of May I have painted several full battalions in addition to lots of artillery and civilians: Sherburne's Additional, 10th Virginia, Marbleheaders and the 4th, 20th and 21st Regiments (100 figures between them). I find painting larger units becomes tiring after a while and I want to catch up with some discrete packs and additions/amendments to existing units. 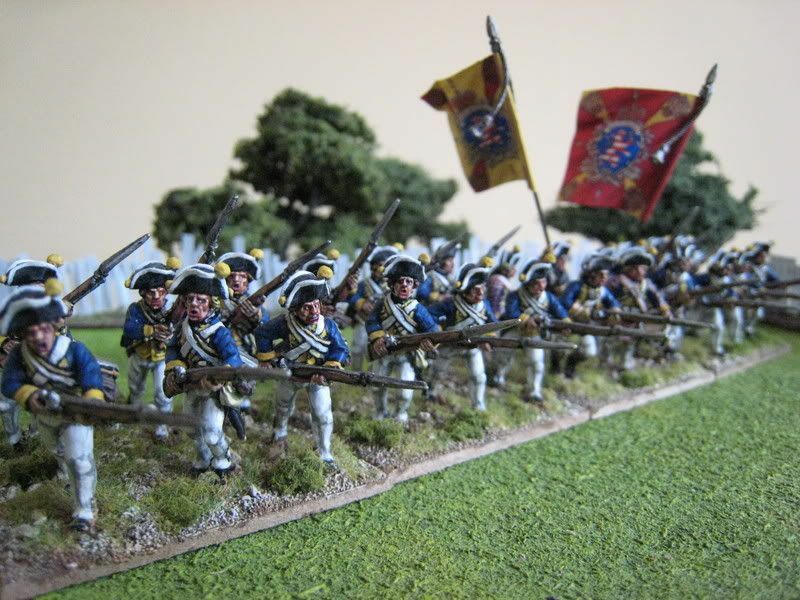 For example, I painted the Hessian du Corps Regiment a couple of years ago but at 18 figures it is 6 men short of what it needs to be, so I want to paint those extra figures. I also need to repaint the cuffs on my Knyphausen Fusiliers. 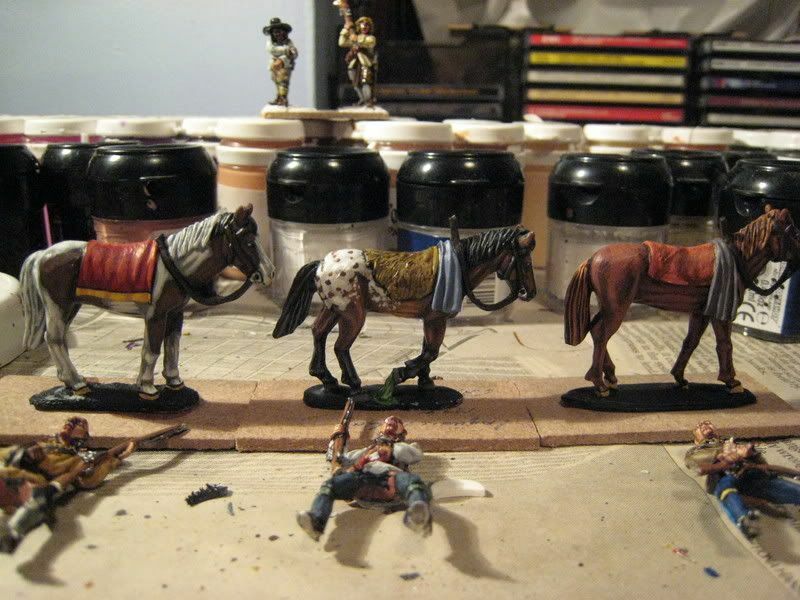 Then there are some odds and sods I want to paint, such as Conquest's mounted Indians and settlers. 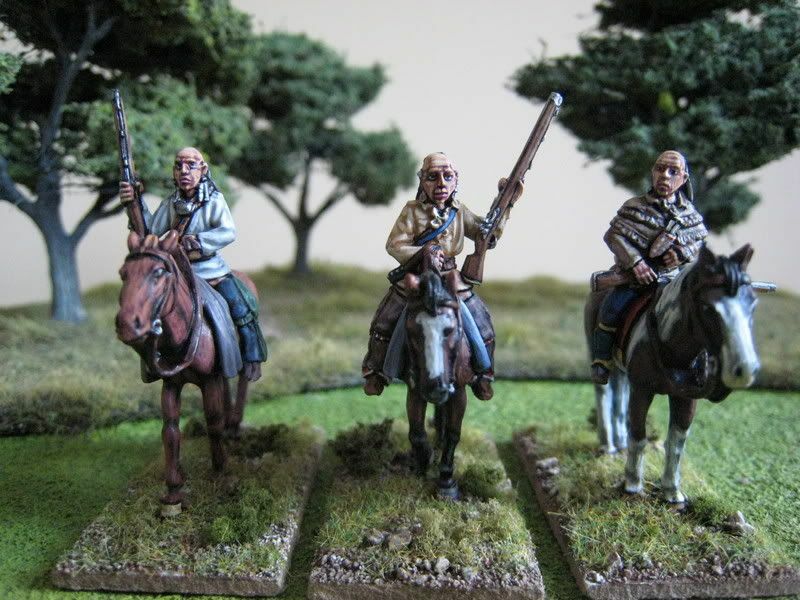 Secondly, I want to finish off some non-AWI stuff that's been hanging around for a while - ECW, Sudan and some more French Napoleonic cavalry. So no more Big Battalions for October! Normal AWI service will return in November - I have the 62nd Foot and 2nd New Hampshire pencilled in.